The University of Santo Tomas Entrance Test (USTET) results are out. However, you might be one of those who did not qualify for the course you applied for. Maybe you just had one subtest score not making it to the cutoff. Almost qualified, but just didn’t make it. Sayang. 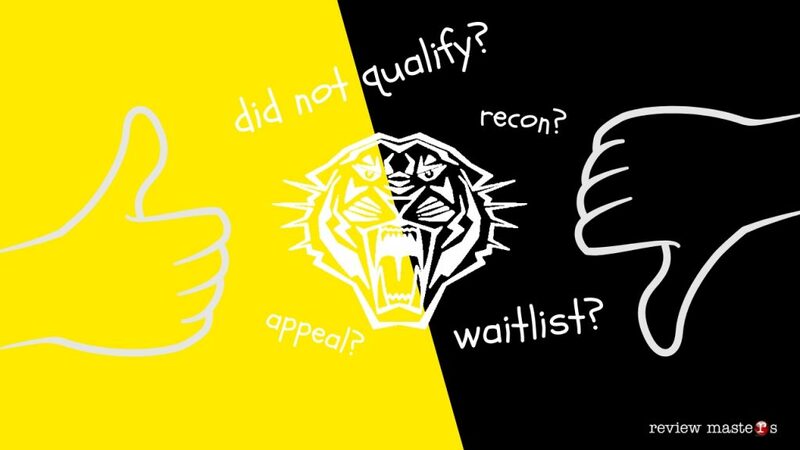 The question now is… Is there still a chance to get accepted to UST? What’s nice about entrance exams and the process of college admission is that even though you do not qualify, universities are still giving students opportunities to get admitted. This process is referred to as reconsideration. The good news is UST is offering this option to students whose scores did not quite make the cutoffs. The process is simple for USTET reconsideration: you just need to write an appeal letter to the Dean of the college you want to apply to. In your letter, explain why you want to enter the college and why they should reconsider your case. The dean will then evaluate your appeal and give you the details of the requirements and dates for follow-ups. TIP: Be enthusiastic about being a Thomasian in your letter. Explain with sincerity why you want to be in UST. Just to be sure, bring the following requirements when you submit your appeal. You’ll never know which document will come in handy when you process your appeal. Letter of appeal (REQUIRED) – Prepare two (2) copies, one for the UST office and one for yourself. Please take note that your chance of being admitted still depends on the availability of slots for the degree program you applied for. Remember that the qualifiers are given utmost priority for the slots. Also, there are courses that are really popular and competition for slots for those courses is tough. So choose your degree programs carefully and manage your expectations. This is where it gets tricky. UST has about 20 colleges serving about 110 undergraduate courses. And each college and course has a different cutoff score requirement and variation of the reconsideration process. Dates and deadlines will differ per college. Also, some colleges will require a face-to-face interview before you get admitted. However, some students get lucky and go straight to enrollment after their appeal get evaluated. Probably the most important tip in the USTET reconsideration process is to physically inquire at the Dean’d office of your target degree program and ask them about the details of the appeal process. They are the ones who will evaluate your appeal, right? You need to tap into their minds because they know the ins and outs of the process. If your appeal gets rejected, you still have another option to enter UST. Like other major universities, you can still apply for transfer if your really want to be a Thomasian. Study for one year in another school, get good grades, apply for transfer and take the exam. I hope you will help us.Thank you and God bless! If one of the requirements for reconsideration is ustet result i cannot show you any of that. But can you also reconsider me if i wasn’t able to take the exam from the start? I really want to take ustet. Give me a reconsideration also please. Hi! I am going to write Recon Letter sa UST pero di ko talaga kung pano ko sisimulan. Ano po yung mga kailangang ilagay pa sa letter aside from why I would like to enter and why should I be reconsidered? So I am an incoming freshman qualified to the college of commerce specifically BA Marketing (my alternative program) but I really want to take BS Psychology (which is my priority program). I already reserved my slot for the program that I was qualified . Can I be reconsidered to my preferred college even though I am already qualified to another college?